A little over a year ago I made what remains one of my favorite projects ever. I love this little sun. I love how imperfect it is. I love how rugged it is. I love what it says. My sister loves it too. She loves how imperfect it is. She loves how rugged it is. She loves what it says. She wanted one for herself. To hang at over her back garden patch. So she could see it from her bathroom window. Her back garden patch is like a mile from her bathroom window. Which means she needed a BIG sun. Like HUGE BIG. 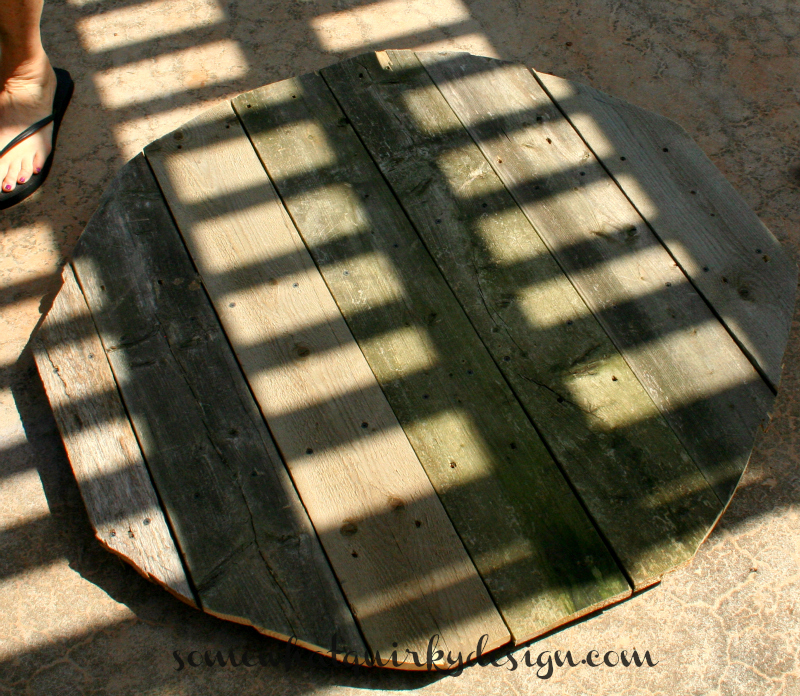 So this time I made a huge big circle out of fence planks. The ones left over from my flag. And I screwed them together. 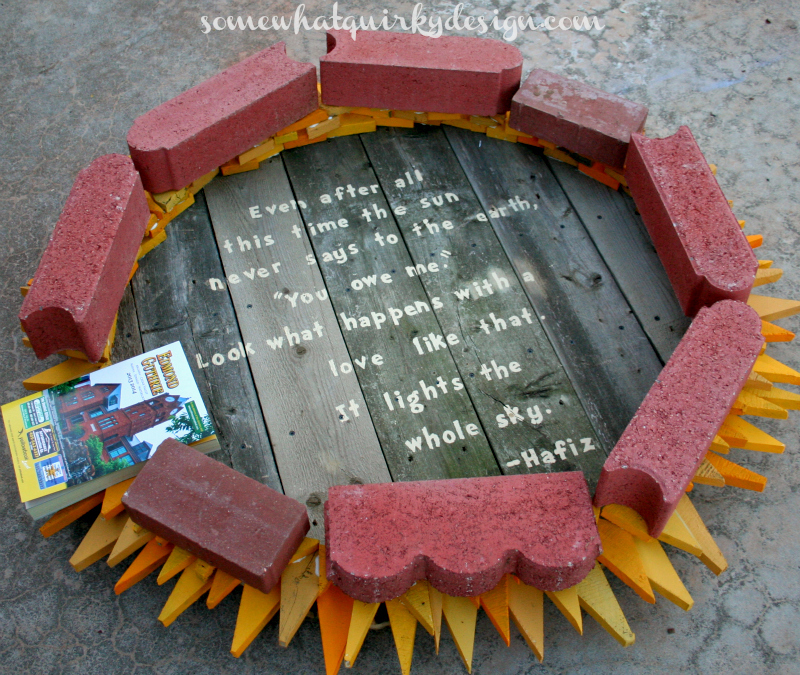 Then I cut them into a rough circle with a circular saw. Not a bad circle for a straight saw, huh? I cut a bunch of wood into random triangles to make the rays and threw them in a big ole bucket. 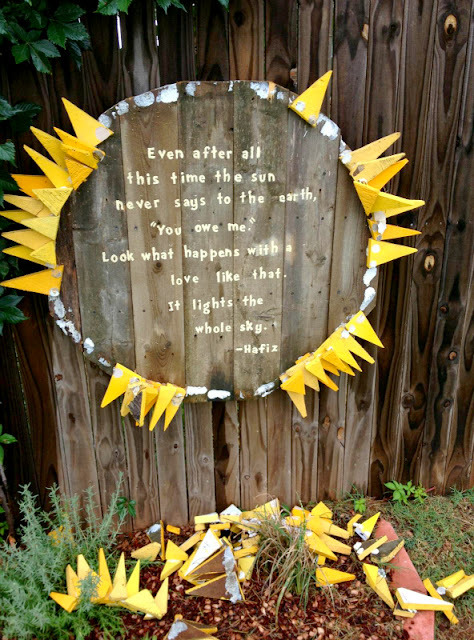 I put them in my car and drove to Oklahoma to make a sun with my sister. She stenciled the words while I painted all those dang triangles five colors of yellow. We glued on the rays in layers. Then we had to let them dry for a day or two with weights to hold the rays into place. I love our giant sun. It's more than 36 inches wide! I think it is magnificent! It's even beautiful from the bathroom window. We used a heavy duty adhesive to glue on the yellow pieces. And it worked great. For weeks. Until it rained. A bunch - I mean A BUNCH of the rays fell off. Any ideas on a really great, heavy duty, waterproof adhesive to repair it with? I love it! How about using silicone? I bet Liquid Nail in a tube like caulk would work great! I hope you are able to fix it. I just love it! 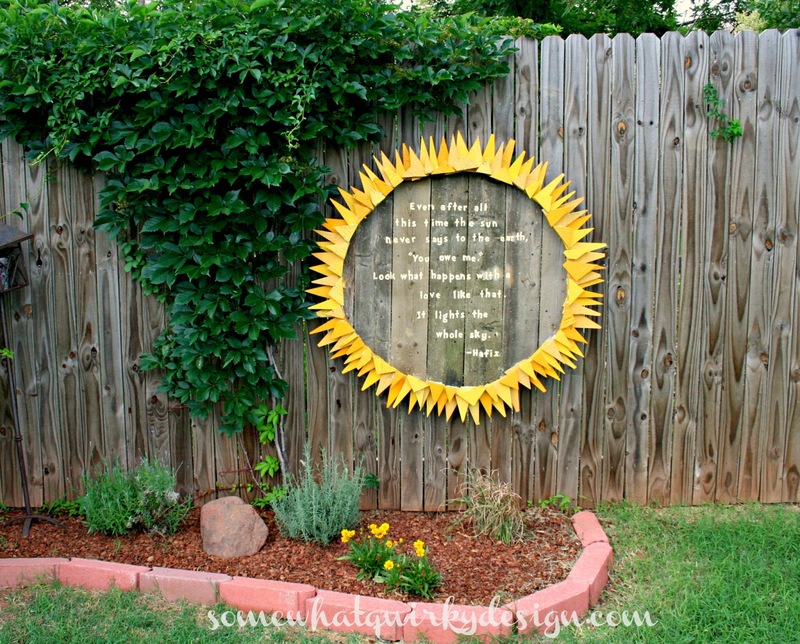 What a creative way to brighten up your yard. Beautiful project. and so sorry that it had come undone. Just gotta remember when having outdoor projects like this you need the right type of glue. Titebond Construction Adhesive - Ideal for bonding FRP panels to drywall, non-treated plywood, greenboard, concrete, concrete backerboard and most other common porous building materials. LIQUID NAILS Construction Adhesive - Extreme all-weather formula, bonds the heaviest materials . GORILLA GLUE Polyurethane Adhesive - 100% waterproof: does not break down when exposed to outdoor elements Versatile: bonds wood, stone, metal, ceramic, foam, glass and more. When using any of these glues you will still need to use clamps or use heavy weights till glue has had a chance to set;@ least for 24 hour period. Best of luck and when you're done, you can come and make me one :} I absolutely love your sun. Gorilla Glue? 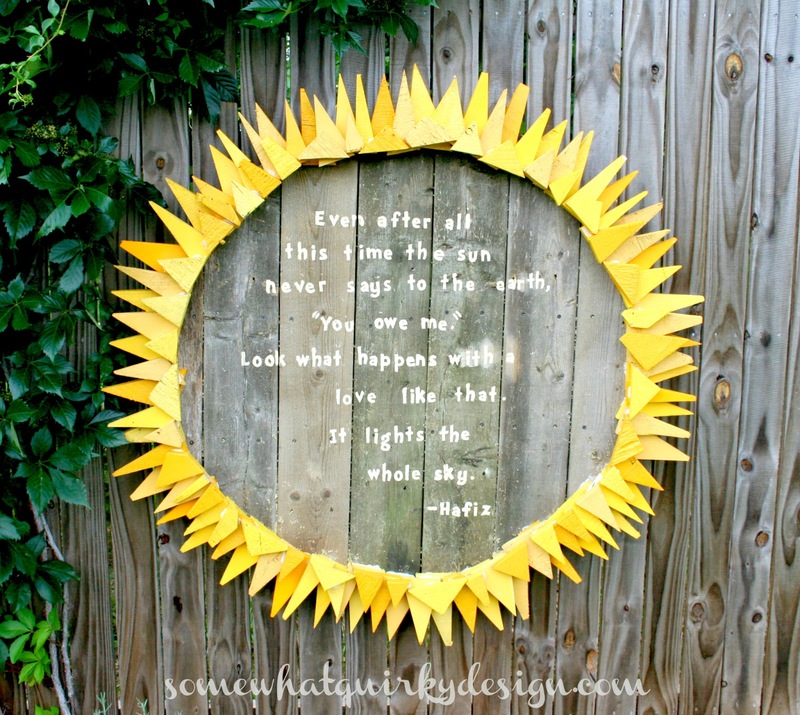 I love this little pop of art and color on your fence. Plus, I read this quote somewhere before and have always loved it! Oh my Karen! It's gorgeous! I'm so sorry that it didn't survive the crazy rain! I was going to suggest gorilla glue or liquid nails and I see they have already been suggested. I hope your sister fixes it! I love it! Get out the screw or nail gun and never worry about falling rays again. Love your sun, Karen. I was going to say Gorilla Glue, but the nail gun would be great, too. I need one. Hope you can find something that works! I am a fan of liquid nails, myself. Only nail if you have a nail gun. I hate hammering, which is why I never do it. E6000 glue will hold most anything. I found my tube at Michaels. By the end of the days of rain there were only about 20 pieces left attached. I'm going to try gorilla glue today and hope for the best. Wow! 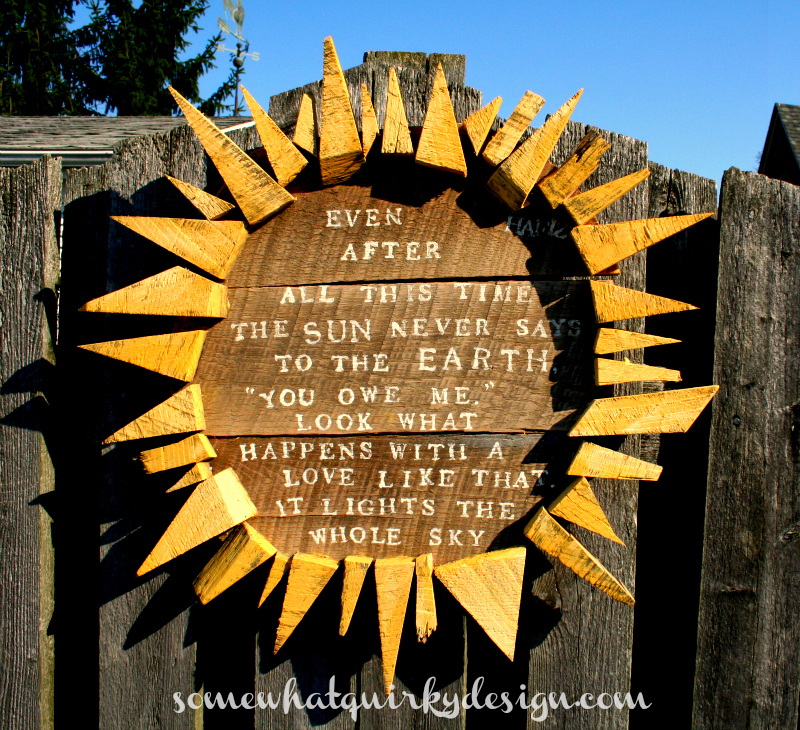 I love your sun, too. And it made me sad to see all those rays on the ground. I'm with the folks recommending Liquid Nails--that stuff holds everything! Love this project. I remember the sun from last year and love your new version. I'd say liquid nails too ! I love the sun! The picture with the missing rays is so sad!!! What glue did you use initially? I was going to say E6000 as well--and then let it cure for a few days (as you did). I didn't let the last thing I made with it cure long enough...I'll be interested to hear about the Gorilla Glue, too, though. Darn it...so sorry to see such a pretty sun rained on! I hope you can fix it with some heavy duty adhesive! It's so creative! Keep us posted. I love this sun! Love the sentiment, love the design, love everything about it! Sorry about the rays falling off. I was going to suggest Liquid Nails too. I think they might have an outdoor/waterproof formula. Maybe try it on something else to be sure it holds before you go to the trouble of gluing them all back on again. That could be a good experiment to blog about....What to Use if You Need an Outdoor Glue. ;) Let us know what you figure out. Have a great day! I reglued half of the first layer of sun rays with gorilla glue. I didn't finish because I wanted to make sure it would work. I let it cure for a day and it seemed really secure. Last night it rained again and I was glad, not just because we always need summer rain, but because it would be a good test for the gorilla glue. Well...all the pieces were loose and easily came off. So try number one was liquid glue. Fail. Try number two was gorilla glue. Fail. I'm depressed. WHat a fabulous idea this is Karen - OMG I love it!!!!!! Or you could screw each one into the fence??? That is one fabulous project. I have used epoxy glue for outdoor projects and it can stand up to just about anything, but be sure to take the old glue off first. A few nails might be good too or better yet some wood screws. I love your sun!! 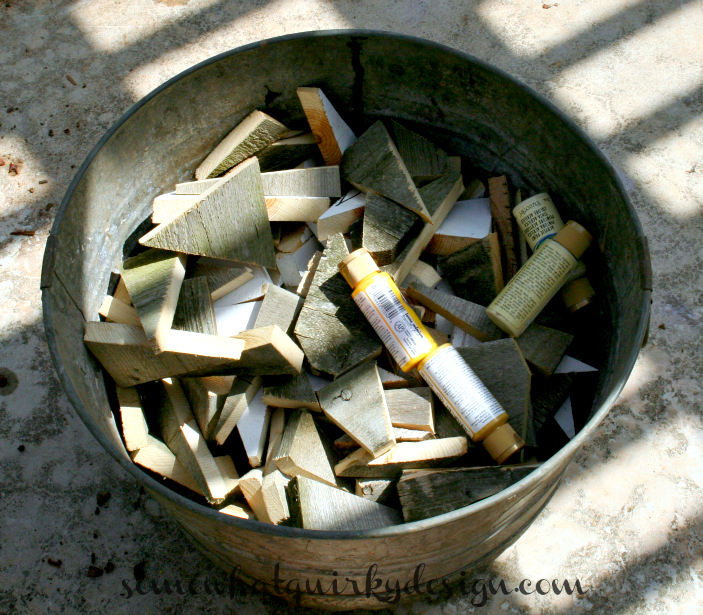 I use Marine Goop Adhesive on all my outdoor projects and so far it's worked great. It's meant to be used on boats, and it's UV and water resistant. My projects are usually metal, but it says it works on wood too. Visiting from IC party. Oh, I think I need one of these! Love how "sunny" it is :) Good luck with getting them to stick again. Let me know what works best - I have a few outdoor projects lined up! I know I'm years behind on this post, but I would recommend marine glue. You can find it at Lowe's. 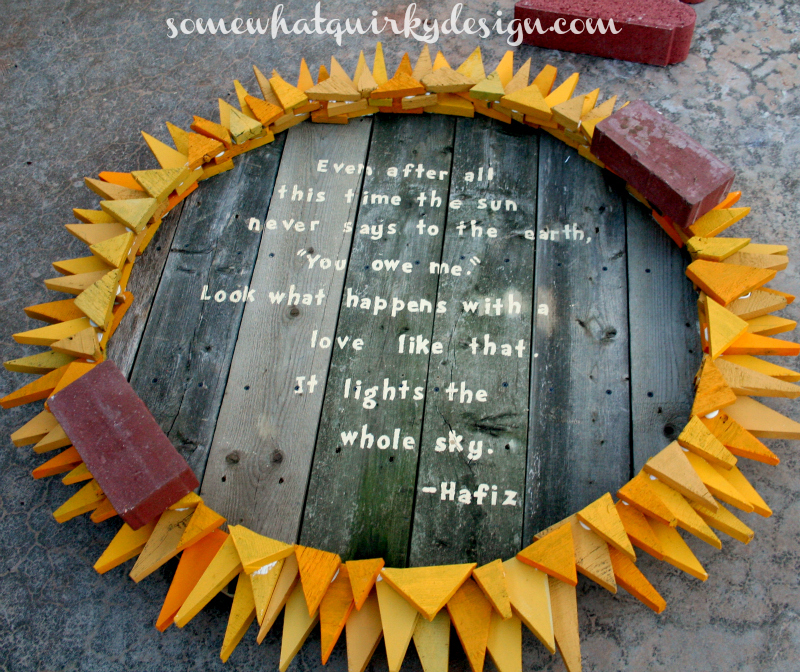 Love, love your sun! 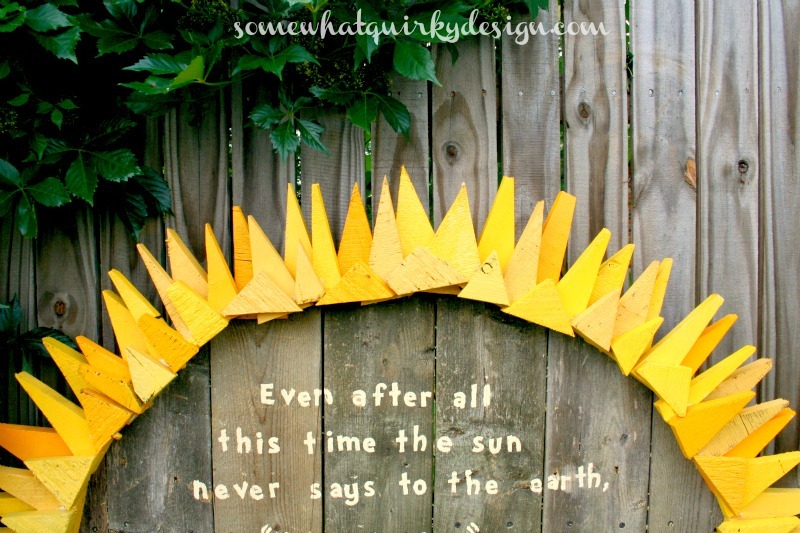 Hello Karen I am a sun lover as in different artistic sun designs. I found this scrap sun of yours on pinterest and shared it on my facebook page Unique Works. It has proven to be very popular on my page so thanks for your creative sun. Hope you don't mind if I make one of my own for my garden pallet fence.